Michael J. Maddigan, Middleborough historian and author of the popular “Recollecting Nemasket” column in the Middleboro Gazette, has published his fifth book of local history, Star Mill: History & Architecture. Star Mill is published by Recollecting Nemasket, a new local history press devoted to publishing and selling histories related to Middleborough and Lakeville. 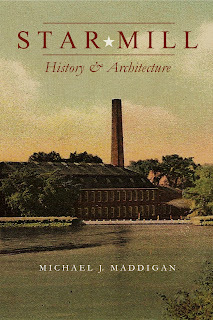 This new history illustrated with images of the mill and its workers tells the story of Middleborough’s historic Star Mill which is a history of contradictions. Though during the decades following the Civil War the Star Mill was Middleborough’s largest employer and heaviest taxpayer, the town was better known industrially for its manufacture of boots and shoes. The Star Mill was a relatively paternalistic employer providing for the safety and accommodation of its workers, but its wages were among the lowest in the state and its successor, the Nemasket Worsted Company, collapsed partially as a result of a protracted labor strike. And while in retrospect the manufacture of woolen cloth is considered to have been a successful enterprise during the period in which it was carried out in Middleborough (1864-1924), the industry was plagued by periods of inactivity when the sagging fortunes of the woolen market forced periods of idleness upon the mill. Though textiles are no longer produced in Middleborough, the Star Mill remains. As the oldest surviving woolen mill complex in southeastern Massachusetts, the Star Mill reflects the era when Middleborough was evolving rapidly from Plymouth County’s leading agricultural town into an important center of manufacturing. Star Mill: History & Architecture documents the previously untold story of Middleborough’s woolen industry, the building that housed it and the people who lived it. Mike’s other books include Images of America: Middleborough, South Middleborough: A History, Elysian Fields: A History of the Rock Cemetery and Lakeville’s King Philip Tavern. Future books from Recollecting Nemasket include Representatives of the Great Cause: Middleborough Soldiers and Their Letters from the First World War scheduled to be released this November.